Walking & Cycling products - Website of smartourism! This new page combines all walking and cycling products of the Smartourism members. So if you have clients that are interested in these products, it's all right here on this page! For more news, go the the News page! 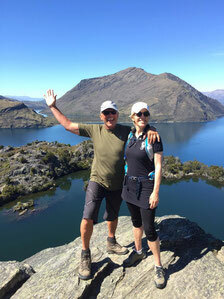 Come and join us on a 3-hour trip to our favourite place on Lake Wanaka, Mou Waho Island. Where you can find an island, on a lake, on an island, on a lake, on an island in the sea! Mou Waho Island is a protected nature reserve and is home to many native New Zealand birds including the curious and flightless Weka. Stunning full day guided walks as well as overnight packages! Mountain biking packages also available. Guest staying at Ti Kouka House can experience a range of short and longer walks nearby. A must is a short 1-hour or a bit longer 3-hour walk at Punakaiki. Your hosts Russell and Sandy will provide you with a walking map and can also drop you off or pick you up for walks that are one-way. 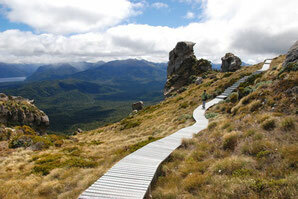 With its World Heritage National Parks, stunning rainforest and rugged beaches, the West Coast is a walker's paradise! Click here for more information on Ti Kouka House, a luxury bed & breakfast near Punakaiki. 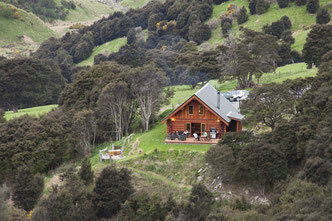 Cascade Creek Retreat - near Milton (Dunedin) is a 5 star Gold Qualmark off the grid luxury log cabin. There are a number of short and longer walks clearly signposted from the Retreat. Bushwalks and walks through the hilly farmland. After your walk, relax in the outside bath... bliss! For more info on Cascade Creek Retreat, click here. The Hump Ridge Track is part of the Department of Conservation new Manaaki Trails, guided walking adventures in some of New Zealand’s most special places. Click here for more info on the DOC website. This 3-day loop track has several walking options, and the best one is the 3-day/3-night guided walk! New: Guided Walk and Jet Boat Combo; Click here for more info. 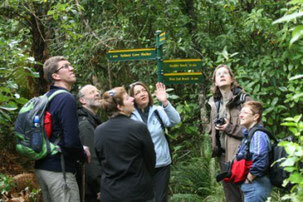 Highly acclaimed Ulva's Guided Walks offers half day guided walks on Ulva Island Bird Sanctuary. Vertigo Bikes is Queenstown's longest established biking company and offers Guided Mountain biking, heli biking , Queenstown Bike Park packages, mountain bike lessons & rental and access to the NEW Queenstown Cycleway on the Vertigo Bike Taxi! Click here for more detailed information on Vertigo Bikes!